As I mentioned in What should an ABAPer continue to learn as an application developer, function programming language is a mind -blower to ABAPers who have got used to ABAP as an imperative programming language. One of important concept in functional programming is Currying. The name “Currying”, coined by Christopher Strachey in 1967, is a reference to logician Haskell Curry. Although the concept defined in wikipedia looks a little bit obscure, in fact every one should have already learned it during his / her high school in mathematics class. 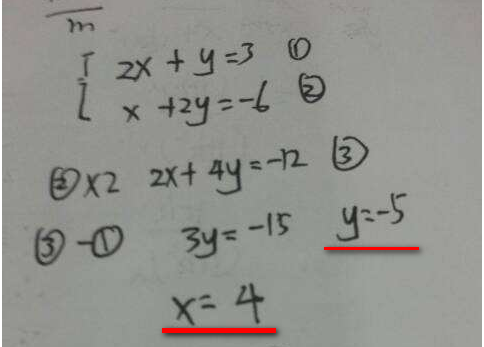 Still remember how you resolve this equation below? During the process, you are actually applying the Curry idea! Let’s now see some real example in code. 1. in line 3, I define a Curry function as a factory, which will return a NEW function with bound argument passed in Curry call. 2. in line 9, I get a new curried function curriedPrint with a default programming language ABAP. It means from now on I can call this new function without passing ABAP as argument any more. 3. In line 11 I call this new function by specifying other languages. A typical advantage of Curry is, it is now possible to develop a couple of small but REUSABLE functions with fine granularity and fulfill complex requirement by constructing them via Curry. 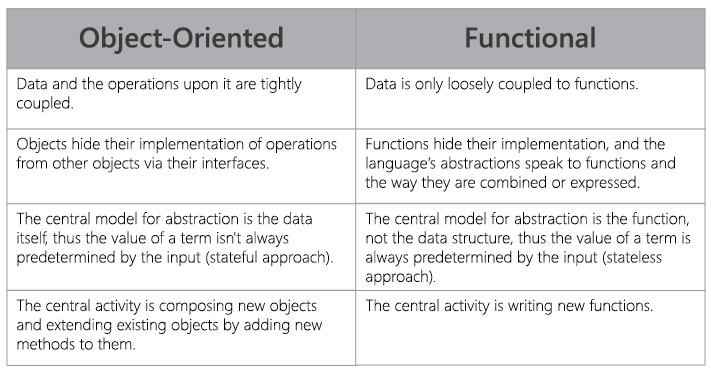 The conversion task is not done via the idea of functional programming: it simply leverages the built-in method provided by String and Array. Among lines 8 ~ 11, four dedicated functions are defined and each one has its single responsibility. Finally a new conversion function is composited in line 13, this process is called function composition. Now let’s see how to implement the first language print example in ABAP using Curry. Always keep in mind the idea of Curry: suppose I have a function with m numbers of arguments. I construct a new function bound with a set of say n numbers of argument passed during Curry process, and after that I can just call the new curried function with ( m – n ) numbers of argument. Let’s first see what can be achieved in ABAP. WRITE: / 'Jerry can program with the following: ' COLOR COL_GROUP. WRITE: / iv_first COLOR COL_NEGATIVE. WRITE: / iv_second COLOR COL_HEADING. WRITE: / iv_third COLOR COL_POSITIVE. And this function module can simply be curried via factory method ZCL_CURRY by passing name of original function module plug bound argument value. 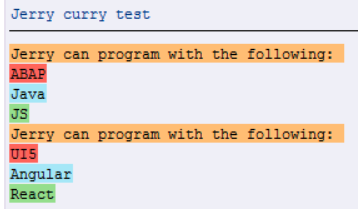 In the first time, when I call first curried function module, although I didn’t explicitly specify the first argument with value ABAP, still it appears in the result output, since the value of this argument is already bound to the “context” of curried function module when it is constructed. The same rule holds for the second round test, where I bind two arguments to the second curried function module. How it is implemented in ABAP? And my ABAP implementation consists of three steps. Step1: parse the signature of function module to be curried, to prepare the dynamical generation of curried function module in next step. Step2: technically speaking the curried function module has the same signature as the original function module, so just generate it dynamically by making use of signature parsed from first step. Step3: source code post adaptation. This post activity consists of two further steps. 1. For those parameters which already have bound value passed in during curry call, use the bound one instead. 2. Populate source code which will internally delegate the call to the original function module. DATA: ls_para LIKE LINE OF lt_ptab. ls_para = VALUE #( name = 'IV_FIRST'  kind  = abap_func_exporting value = REF #( _iv_first ) ). ls_para = VALUE #( name = 'IV_SECOND'  kind  = abap_func_exporting value = REF #( _iv_second ) ). ls_para = VALUE #( name = 'IV_THIRD'  kind  = abap_func_exporting value = REF #( _iv_third ) ). CALL FUNCTION 'ZJERRY_PRINT' PARAMETER-TABLE lt_ptab. Finally ZCL_CURRY provides a method CLEANUP to delete those automatically generated function module. Source code of ZCL_CURRY could be found here. Hope this little prototype can help ABAPers to have a basic understanding about Curry concept in functional programming world.